Proposed development would include a nearly 30,000 square foot Sprouts Farmers Market. The Cave Creek Planning Commission barely managed a quorum of four members at their September 20 meeting, as they looked at possible solutions to parking in the downtown business core and new businesses south and west of Carefree Highway and Cave Creek Road. A request was made by Peter Spittler to rezone one and a half acres of land between the Viola Lane right-of-way and the base of Brenner’s Hill, east of Hidden Rock Road. Spittler said the zoning change from Single Residence to Town Core Commercial would allow a parking area to be created to alleviate some of the parking issues and congestion around The Buffalo Chip and Harold’s, especially on Wednesday and Friday night bull riding and during special events. Spittler said the area could hold 157 parking spaces. One of the Commissioners noted the property was very much below the grade of Cave Creek Road and even a two story structure would likely not be visible from Cave Creek Road. Spittler was asked what he planned for the adjacent property he owns going up the side of Brenner’s Hill. Spittler said he currently has no plans for that property. Town staff noted it is an area they would like to preserve. No one spoke against the zoning change at the meeting, but Commissioners did receive one letter in opposition. The change was recommended by all four Commissioners in attendance. 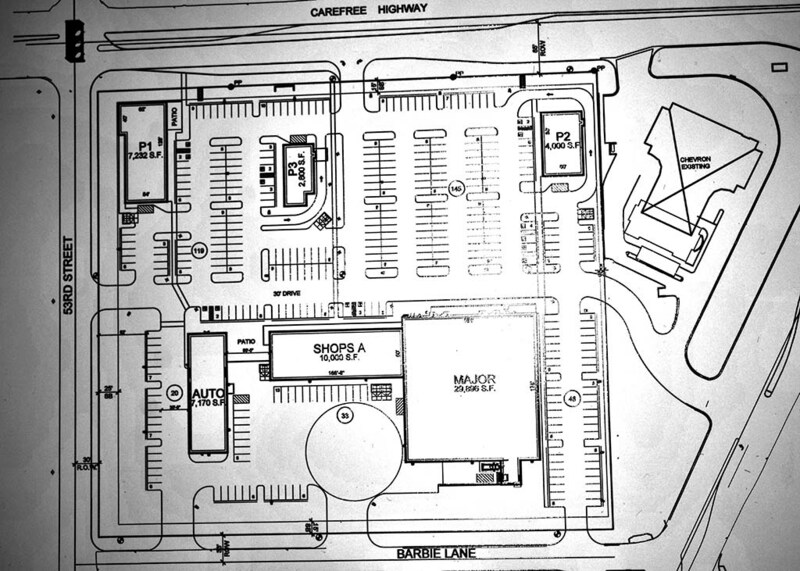 A nine acre retail development at the southeast corner of 53rd Street and Carefree Highway was also before the board for a zoning change and site plan approval. The parcel which is marked for commercial development on planning maps, is currently zoned Desert Rural. Park West Partners/Kitchell Development Company wants to put in a six building shopping center with over 61,000 square feet of commercial space spread over six buildings. According to developers the anchor tenant, Sprouts Farmers Market, will occupy nearly half that space. This part of Cave Creek gets water service from the City of Phoenix, so will not affect Cave Creek’s water allotment. However, because of lower water pressure in the area, water for fire suppression will be provided by the Town of Cave Creek. Sewer service is also provided by Cave Creek. To address increased traffic flow, a traffic light will be installed at 53rd Street and Carefree Highway as part of the development process. The light is not required according to traffic studies, but would be a necessity by 2024. A deceleration lane into the shopping center would also be added on the eastbound side of Carefree Highway and a left turn lane added to the median westbound. Access would also be available from Cave Creek Road via Barbie Lane, which borders the property on the south side. There will be a deceleration lane southbound on Cave Creek and a left turn lane in the median for northbound traffic on Cave Creek Road. Traffic would only be allowed to turn southbound on Cave Creek Road from Barbie Lane. Less than five percent of the area would be left undisturbed, far less than the required 20 percent. Town code does allow developers to present a deed showing other land in the Town put in preservation to make up the requirement. The previously mentioned Brenner’s Hill was one of the areas noted for preservation. Howard Zikes was the only person to speak against the proposal. The resident of 52nd Street voiced concerns that motorists may detour down 52nd Street then over to Cave Creek Road to avoid traffic at the shopping center and the intersection of Carefree Highway and Cave Creek Road. Planning Commissioners suggested he contact the Town Engineer about installing traffic calming measures on 52nd Street to discourage drivers from trying to find an alternate route. Commissioners voted in favor of the zoning change and the site plan. Caffeinaholics may soon have a new place to imbibe. The Planning Commission also recommended approval of site plan for a Dutch Bros. at the southwest corner of Cave Creek and East Olesen Roads, just south of Tractor Supply. The proposed building would be only 900 square feet with a 1200 square foot covered outdoor seating area. For those unfamiliar with Dutch Bros., the locations usually only have drive-up and walk-up service, with no indoor seating. This area is also in the part of Cave Creek that gets water service from the City of Phoenix, so would not be using Cave Creek water unless needed for fire suppression.